On the eve of the 10 year anniversary of Hurricane Katrina, my thoughts are with those who survived its devastation and the loss of their loved ones. In this memoir excerpt, I think back to my own vigil at that time, waiting by my mother’s side as she lay dying. In the lobby, scenes play out on television of the death and destruction brought by Hurricane Katrina as my mother lies dying. I watch as desperate people cling to rooftops struggling not to drown. I feel I am drowning too as death churns around us, lapping at us like the flood waters from that great storm. I feel tremendous empathy for their suffering while I witness my mother suffering on a different level, as her body slowly begins to shut down and her face winces in pain. Morphine finally helps to make her more comfortable and now she looks humble and peaceful, as the long hours pass and visitors come and go. Then our family encircles her, holding hands as she releases her last breath with grace and dignity. We are brought closer by the intimacy of death. At home, we sit up late into the night talking, crying, and reminiscing. For she is gone. As Dad and I enter the psychiatric facility to see Kathy, I am filled with trepidation. I know we will be telling Kathy about mom’s death but also this place feels hopeless to me. It is one of the worst ones—patients are milling about long halls with open doors, it is noisy and disorganized. We met with Kathy in a drab lounge. I notice a cartoon-like drawing on the bulletin board and recognize it as one of her drawings of a small, carefree figure and I praise her for it. Kathy is withdrawn. Her dark hair is dirty and uncombed, her clothes unkempt. This is neither a good place nor a happy time. We have brought her a chicken sandwich. Before too long, Dad gives her the news. Kathy is quiet and stops eating the sandwich. “This is like the sandwiches Mom made.” Her words hang in the air. Then she breaks down. I wrap my arms around my sister in comfort. Both of us cry a bit, drawing from a shared well of grief in that small, grey room. When it’s time to leave, I tell the nurse that Kathy’s mom has just died, hoping they will show some extra kindness to her. I am sorry and sad to leave her there but it won’t be long before she returns to the Button Street board and care, where she has lived before and considers as a real home. A place where she feels safe and well cared for. 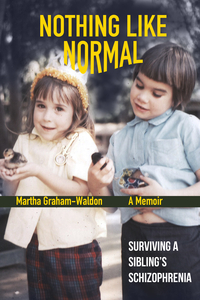 From Nothing Like Normal–Surviving a Sibling’s Schizophrenia. Coming from Black Opal Books on November 14. This entry was posted in Uncategorized and tagged Death, Death with Dignity, Grief, Hurricane Katrina, schizophrenia, Storm. Bookmark the permalink.